thulasithara~ the earth under thulasi / the platform in front of Hindu houses where Thulasi is grown to Welcome Goddess Lakshmi. At "sandhyaa"[twilight] a burning lamp is placed on the platform. Basil (Ocimum spp.) has its roots in India and Africa. The 'tulsi' plant or Indian basil is an important symbol in the Hindu religious tradition. The name 'tulsi' connotes "the incomparable one". 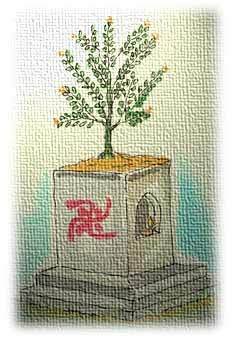 Tulsi is a venerated plant and Hindus worship it in the morning and evening. Tulsi grows wild in the tropics and warm regions. Dark or Shyama tulsi and light or Rama tulsi are the two main varieties of basil, the former possessing greater medicinal value. Of the many varieties, the Krishna or Shyama tulsi is commonly used for worship. Places that tend to inspire concentration and places ideal for worship, according to the Gandharv Tantra, include "grounds overgrown with tulsi plants". The Tulsi Manas Mandir at Varanasi is one such famous temple, where tulsi is worshipped along with other Hindu gods and goddesses. Vaishnavites or believers of Lord Vishnu worship the tulsi leaf because it's the one that pleases Lord Vishnu the most. They also wear beaded necklaces made of tulsi stems. The manufacture of these tulsi necklaces is a cottage industry in pilgrimages and temple towns. Apart from its religious significance it is of great medicinal significance, and is a prime herb in Ayurvedic treatment. Marked by its strong aroma and a stringent taste, tusli is a kind of "the elixir of life" as it promotes longevity. The plant's extracts can be used to prevent and cure many illnesses and common ailments like common cold, headaches, stomach disorders, inflammation, heart disease, various forms of poisoning and malaria. Essential oil extracted from karpoora tulsi is mostly used for medicinal purposes though of late it is used in the manufacture of herbal toiletry. According to Jeevan Kulkarni, author of Historical Truths & Untruths Exposed, when Hindu women worship tulsi, they in effect pray for "less and less carbonic acid and more and more oxygen - a perfect object lesson in sanitation, art and religion". The tulsi plant is even known to purify or de-pollute the atmosphere and also works as a repellent to mosquitoes, flies and other harmful insects. Tulsi used to be a universal remedy in cases of malarial fever. "When the Victoria Gardens were established in Bombay, the men employed on those works were pestered by mosquitoes. At the recommendation of the Hindu managers, the whole boundary of the gardens was planted with holy basil, on which the plague of mosquitos was at once abated, and fever altogether disappeared from among the resident gardners." Quite a few myths and legends found in the Puranas or ancient scriptures point to the origin of importance of tulsi in religious rituals. Although tulsi is regarded as feminine, in no folklore is she described as the consort the Lord. Yet a garland solely made of tulsi leaves is the first offering to the Lord as part of the daily ritual. The plant is accorded the sixth place among the eight objects of worship in the ritual of the consecration of the Kalasha, the container of holy water. According to one legend, Tulsi was the incarnation of a princess who fell in love with Lord Krishna, and so had a curse laid on her by his consort Radha. Tulsi is also mentioned in the stories of Meera and of Radha immortalised in Jayadev's Gita Govinda. The story of Lord Krishna has it that when Krishna was weighed in gold, not even all the ornaments of Satyabhama could outweigh him. But a single tulsi leaf placed by Rukmani on the pan tilted the scale. In the Hindu mythology, tulsi is very dear to Lord Vishnu. Tulsi is ceremonially married to Lord Vishnu annually on the 11th bright day of the month of Karttika in the lunar calendar. This festival continues for five days and concludes on the full moon day, which falls in mid October. This ritual, called the 'Tulsi Vivaha' inaugurates the annual marriage season in India. Used with tomatoes for a spagetti sauce. Click here for a photo ! 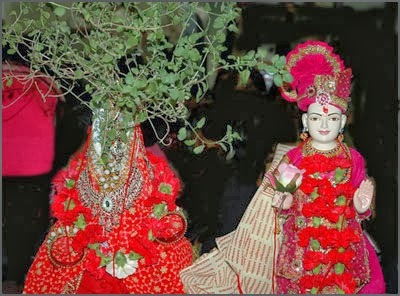 Tulsi Vivah is the ceremonial marriage of the Tulsi plant (holy basil) to the Hindu god Vishnu or his Avatar Krishna. This ceremony is performed on the eleventh or the twelfth lunar day.In the lunar Hindu calendar, Kartika begins with the new moon in November and is the eighth month of the year except in Gujarat, where it marks the new year that falls on Diwali. In the solar religious calendar used in Tamil Nadu, Kartikai begins with the Sun's entry into Scorpio and is the eighth month of the year. I live in Japan and would like to find someone here who could spare a few Krishna (Purple) tulsi seeds. Could exchange seeds.